The Panasonic MCYL699 is everything you would want in a vacuum cleaner. Offering unmatched power and delivering an impeccable design, this Panasonic Vacuum Cleaner is guaranteed to satisfy you at every turn. The Panasonic is equipped with an abundance of features which work together to give you an enjoyable cleaning experience. Featuring a 20L dust capacity and an anti-bacteria filter, you can rest assured knowing that you are surrounded with cleanliness everywhere, from the ground to the air. Thanks to its 2100 watt motor power, cleaning will become more effective than ever before while the hose allows you to reach even the hardest of corners. Completed with a lightweight, casters, and an ergonomic design and handle, the Panasonic MCYL627 is easy to move around your home. 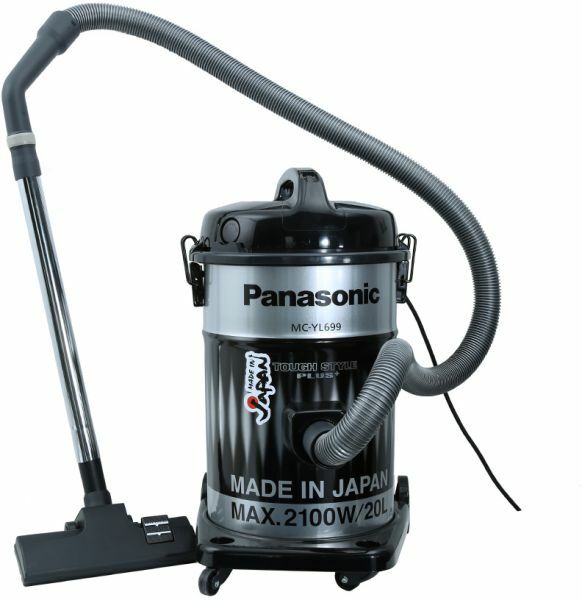 With a black and silver design, this Panasonic Vacuum Cleaner isn’t only effective, it also looks good while in action! Because it’s all about the motor, Panasonic is renowned for always offering top-notch products. Equipped with a powerful 2000 watts motor, you can trust that the Panasonic MCYL625 Vacuum Cleaner is going to deliver an impeccable performance at every turn with a wide range of power and higher standards for cleaning. Because Panasonic cares about your and your family’s health, they are always adding features to care for you. With the Anti-bacteria filter, which includes copper in the fabric for stronger power, your vacuum cleaner can now eliminate odor particles and dust, keeping your air clean and your body free of pollutants. Other than being impeccably designed, the Panasonic MCYL625 is made from durable material. With a stainless steel bottom plate is equipped with a floor brush in front and a wiper blade from behind to prevent dust trails. The non-magnetic plate is rust –proof and is ideal for cleaning hard floors.